Many are the stories about legendary warriors. Achilles the invincible Greek soldier. Richard the Lion-heart the Crusading king. Genghis Khan the ruthless Khan-queror. Just as bountiful are tales of the most intelligent leaders. Hannibal Barca the defeater of the Roman Empire. Napoleon Bonaparte the famous Frenchman. Alexander the Great the undefeated Great. But today, talks of the greatest strategist, a deity in devising plans. I am IceColdPappsi, and in this resurrection guide, I will teach you how to win with cunning, with wits, with... Athena, the Goddess of Wisdom. In SMITE, Athena is a Guardian, a protective beast on the battlefield. Her purpose is to walk up, apply CC, and protect her teammates. Her team composition flexibility really helps her be the glue to any team. Also, all it takes for Athena is the perfect chance. A misstep, an accidental basic attack, and she can turn a team fight around. Now time to go over her kit. When I say Athena is versatile. And the ultimate, mwah, perfecto. After every ability, your spear will glow and become an actual spear, as the next basic attack you fire will be ranged and do your auto attack damage, along with 15% of your magical power. This is a good clear assist, for those pesky archers in the back that always kill you when you're in the red and your enemy is under tower VEL spamming (nah, not mad). It also helps get in some extra little damage for when you start to fight, and can actually kill someone if lucky enough. This is a dash. She passes through all minions, and stops at the first enemy god hit. The hit also slows for a maximum of 25% for 2.25 seconds. This is a great engage and disengage. It can start a teamfight, slow a pursuing assassin on your ADC, or get you with an Not-Even-Close amount of health. Early game, it can get you out of nasty situations, or get that little damage and CC you need. Also, the cooldown does reduce as you level it, so it is a great choice in terms of leveling, but falls off late game, so it will be finished before your ult. This ability also stacks blocks every time you use it, nullifying up to three basic attacks. Your shield glows up as a cool visual effect of this. Additionally, you can use this as a clear tool. If you hit the wave, you can stack the block and get ahead in farm. This ability is everything. It is a wide coned taunt, and makes all affected basic attack you for a maximum of 2 seconds. Again, literally everything. Because this doesn't do any damage, but can lead to a lot of damage done, this will be your second priority. Depending on how aggressive you are, you can trade leveling this either at level 2 or 3, but you will want to finish it before your 1. Two seconds on paper, is nothing. But in game, that is two whole seconds where the enemy can do nothing but just chase and auto attack you. Auto attacks have an innate movement penalty, so it is also technically a slow on them. Two whole seconds where all they can do is take damage, from every imaginable source your teammates have. This is a small circle of summoned soldiers that deal damage when they pop in, and then once more when they leave. This is your main clear. Therefore, it will be first, and can provide some much needed farm. When using it to clear, popping it on the archers will reduce the damage of the minions, but putting it on the brutes will reduce the push of the wave. It gives you a choice of how to deal with the minions. It is a note that the brutes have more health, but the archers do more damage. This is also effective in the jungle, as you will have the creeps around you, you can tag them twice easily, and clear by yourself early on. Also, you can combine this with your taunt so that while your enemies are attracted by your big assets you can deal some damage to them, twice if your positioning is great. and you charge up a giant leap for 4.2 seconds, and then teleport to them. During that charging time, your selected teammate gets a 20% damage taken mitigation. This is an ultimate. Just level it how you see fit. It is important to note that the cooldown does reduce as you level it more. No really, this is what I meant by map presence. At any moment, you can go to any of your teammates and start a team fight. You can hop from fight to fight. The smartest strat is to save a teammate with it in the middle of a fight by ulting onto them, so they take less damage, and taunt as soon as you land. This serves as protection and repositioning. Note, do remember that in a fast paced game like SMITE, 4.2 seconds is a long time to charge up. If the designated person does die while you are winding up, the ability will go on Cookson and you will jump up and down like an idiot. Also, assess situations deeply before deciding, because you could potentially put yourself in danger instead. As stated before, Athena is a very versatile guardian, being able to make use of a lot of items. This chapter will focus on each individual item, and how you can utilize it. This item is the equivalent to the last two season's Watcher's Gift, just without the experience bonuses. Along with the reduced shared xp of this season, and supports are having a bad time. However, that isn't to say that this item is bad. The complete opposite. Giving 7 health and mana on each assist of a minion, along with increasing the amount of idle gold/gold per every 5 seconds you get, this item makes supports stay relevant throughout the game. Now is the hardest part of the build, made easy depending on your playstyle: Which boots do I buy? Each one compliments a different Athena, so picking one may default you to that specific persona. Shoes of Focus is for the passive-aggressive type. It gives you power, mana, and cooldown reduction, allowing you to fire off abilities more, but isn't really meant for attacks. The cooldown can help with clear and with rotations, due to your dash and ultimate having high cooldowns. It can also help with ganks, since Confound doesn't reduce in cooldown as you level it. Buy if you like more opportunities opened up for you/are indecisive. Reinforced Shoes is for the persistent fighter. Less aggressive and more counterattacking. Giving protections for taking damage, you wait for your opponent to make a move, proccing the passive, and letting you get more bang for your buck from your taunt, as the enemies are already close to you. It's also a risky tossup, as you have to take damage willingly, which is never good. Buy if you like to be a tanky nuisance. Traveler's Shoes is for the everyman. With this, you can really be a mapwide presence. Move out of base faster, along with the highest movement speed at 25%, and rotations will be a breeze. You can also get out of fights quicker, chase down enemies, gank quicker. But then again, all it provides is speed, its up to you to make use of it. Buy if you want to help wherever, whenever. The good thing about Relics is that you're not limited to how you want to use them. You can choose two, and have completely different uses for them than intended. But then, what are their intended uses? What do they even do? Keep reading. First up in the list is Belt of Frenzy. This gives everyone around you 10% extra damage to everything and 15% extra attack speed for 5 seconds. Upgrade it for 500 gold, and they also get 10 flat penetration, and a longer duration of 8 seconds. This is the objective destroyer. Meant for game-changing teamfights or objective pushes. Either way, it can turn a game around, with just brute strength. We're talking about some real initiation here. Blink Rune lets you literally teleport in front of yourself, allowing for a surprising and rewarding 3-5 man Confound taunt. Even better if you up it a notch for that 10% damage reduction on all people hit 2 seconds after Blinking. I mean, even the pros can wow the audience with this relic. Meant for the impatient Athena, or the smartest one that knows winning this fight can win the game. Skrr Skrr, gotta go fast. Popping Heavenly Wings gives everyone 30% additional movement speed, and an immunity to slows. If you've got some LMB-holders in your squad, the upgrade will give them an immunity to basic attack movement penalty for the duration, 5 seconds. It's not uncommon for a fight to go to the fan, and you need to get out of there fast. Then this is for you. Horrific Emblem surely looks and works horrifically. Slow every enemy's movement and attack speed by 40% and 25% respectively. Furthermore, 500 gold will decrease the damage that affected enemies do by 20%. If you are often in the middle of everything, popping this can make quick work of your slowed foes. Magic Shell gives you the opportunity to give your shield to your teammates. A shield with a maximum health of 340 health at level 20, to be exact. Upgrade it, and the next two basic attacks that connect to you won't do any damage. While it has a short duration of 3 seconds, those precious life points can save someone from getting clapped. Getting close to the end of the list, up next is a very niche relic, up until this season. Phantom Veil still retains the ability to let all allies pass through both players and all player made objects for 5 seconds. Additionally, make it better for 500 gold and you double the duration, and add a 15% damage mitigation to everyone affected. Usually you would get this when facing an Odin, but with the new upgrade, you can turn a fight around if the other team does less damage to you. Alright so, you know how you need to regenerate health AND mana? And then there's Meditation Cloak, that gives you a maximum of 315 health, as well as giving you 30% of your mana back. The upgrade is great, reducing your mana costs by 30% and all your cooldowns by a quick second. This is for either a second teamfight, where some people have died and both sides are set on complete desolation, or in the middle of a current one, where your team is severely overwhelmed. Pop it, and get back in the fight, soldier. Last in the list is a relic with great synergy with your Confound. Popping Shield of Thorns reflects half of all damage back to the owner. This can and definitely will kill bloodthirsty enemies. A cool five, and enemies will heal less from hurting you, simply known as lifesteal. When in the thick of things, like in the middle of a stun, this can make people actually back away from you for 5 seconds. Ole Reliable. Gives health, more health regeneration/Health per 5 seconds, and protections. Additionally, buying this item will give all teammates around you protections and HP5. You would buy this if you intend to stay with your team and initiate team fights often. It insures that if your team gets attacked by physical enemies, that they will receive less damage. Also, the HP5 helps keep teammates alive, as out of combat, this counts as passive healing, and not fighting for about a minute can restore about a quarter of someone's health bar. One of the most famous physical defense items. In the same tree as Sovereignty, it gives health and protections. It also deals damage to those around every second. You can see this in game as an orange pulsing aura. This item has one major use. If you are present by your team, and/or like to stay behind in a teamfight to make sure everyone else got to safety, this item will help give those little points, and you can bet they add up. It can also help chase enemies, because while their running, they'll probably be out of range from your abilities, but not from this aura. Quick note, this item's damage is affected by protections. So if you have an item that reduces protections ( will be talked about later ;) ), it will deal more damage. A certainly interesting item, it gives MP5, magical power, and physical protections. Secondly, it increases your physical protections when out of combat, for a total of 35 protections over 10 seconds. These stacks of physical protection are removed upon taking damage, and will return after staying out of combat for 5 seconds. This item easily gives the most physical protections in the game, and is great if you find yourself not doing anything often, but will have to initiate a fight soon. Do note that minion and jungle damage can remove stacks. This is one of those prominent counter-building items. Gives physical protections, mana, and some MP5 with said mana. Along with that, every basic attack that hits you will also hit the giver by 25% of said damage. This can help with fighting a lot of AA gods, like more than hunter, as all you have to do is get hit to apply damage. The damage can also be altered. If the enemy adc, for example, has tons of pen, even though he hurts you more, he will hurt himself more as well. This also applies to crit. Man, the emperor has two items, lucky guy. This armor piece gives protections and health, but at a lower value then of those stated before. It also reduces the attack speed of towers and phoenixes by 30%, while secondly increasing your own structures firing speeds by 40%. This is for the objectively minded. One kill, and you are rushing that tower, getting some gold, some xp, and some leverage. Quick note, you have to be in the structure's targeting range of 55 units for this passive to work. There is a circle under every structure that dictates its range. If you are not sure if it has worked, look at the structures. Yours will have blue swirls and theirs will have red ones. Great overall pick, can't go wrong with this one. Protections, Mana, MP5, and cooldown. Pure stats, yet so many possibilities in game. This item will usually be built mid game, to give you that edge in survivability and usefulness. With it, you can rotate faster with your dash and ult, taunt more times in a fight, last longer in a fight because of both protections and mana+mp5, just do more. Last item in health and physical protection tree. This one will slow anyone who basic attacks you, movement and attack speed wise. This slow can stack up to three times, and is an independent slow, allowing other slows to still be applied. Let me remind you, Confound makes people attack you, BASIC attack you. Popping a taunt with this item can enemies less effective in terms of DPS for a good time. Mid game, when your taunt isn't fully formed, this effect can last for a good two or three more autos. Starting off the list is the most prominent magical protection item in almost every support build, just like Sovereignty. Magical protections and health, while also providing an aura of magical protections and MP5 to your allies. This item can be a substantial help. The magical protections really help your team against that spell-slingin' mage they have. The MP5 also helps with mana regeneration for you and your allies, so that they can get off more abilities over a period of time. One of the newer items from last season, it has proved itself a great buy. Magical protections, MP5, cooldown reduction, and even some crowd control reduction. This item doesn't even need a passive. Speaking of, all allies get a 20% increase in attack speed. Another objective item, it can help shred some towers. It can also be bought if you have more than one hunter, like a Neith mid or solo, or if you have a hyper carrying jungle like Kali. Combine all the above together, and this item will lead to faster kills, faster objectives, faster wins. Also, the crowd control reduction can keep you up and running faster, as it will get you out of CCs like stuns and roots faster. Say you're facing a Kumbhakarna, and he puts you to sleep, you'll be waking up like you just took some coffee with espresso. It's a great overall item, but best suited for either those who are ahead or smell a comeback. This is one of those items that I hinted at earlier about reducing protections. Giving health, magical power, and protections, it also reduces the magical protections of enemies around you by 15. That amount doesn't seem like a lot, but squishies like the enemy hunter and mage, they don't build protections, and have like, 30-50 tops naturally. It can give your own mage that little bit extra damage he needs. This item pairs well with Mystical Mail, as it helps that item do more damage, upping your chasing. Antiheal, antiheal, antiheal. Highest magical protection, with some health too. Also, all enemy health regeneration, including healing, HP5, and Meditation, is reduced by 25%. Please, buy this when facing healers. 25% is substantial. For a mage healer like Chang'e, this can reduce it by a hundred, give or take. Sylvanus and Terra, theirs is small, this makes it even smaller. Xing Tian, his HP5 is stupid, he can gain back about 100 health by just standing there for like, 2 seconds. Stop this man. Lifesteal from Anubis, passive regeneration like Stone of Gaia, etc. Any and all health regeneration, when around you, is only 75% as effective. One more item, and this one has seen many passives, but the new one is great and fits it perfectly. The usual health, magical protections, MP5, and crowd control reduction. It's current passive gives you 2% damage mitigation for each enemy near you, stacking up to 3 times. Damage mitigation is not the same as protections, which do reduce damage. This reduces ALL damage, not just a specific type. There are abilities and items that bypass protections, like good old tank shredder Qin's Sais and pesky gods like Serqet and her ultimate. In game, it can help you in a team fight, as you will often be surrounded by enemies as you go in and taunt and get pelted by autos. This is the item that was stated in your starting build. Standardly, it gives health and HP5. Also, when you get an assist for minion kills, you gain stacks of physical and magical protections, up to 50. After 50, the item will glow, providing an aura of physical and magical protections to allies around you. This will essentially be your first item. Stacking this early provides a huge advantage in early teamfights. If you happen to have completed it by said early teamfight, the enemy will have trouble dealing damage, because they don't have any full formed penetration yet. The most recognizable of hybrid items. Gives health, mana, and of course protections of both kinds. Another stacking item, every kill or assist on a god gives you 3 additional physical and magical protections, to a max of 21 of each. As of this season, it also evolves now, to give you a regenerating shield with a maximum health of 200. This is for the Athena that takes a fight at every corner. You're ganking left lane, you're not leaving without that enemy dead. They're dead, on to the next. Gotta stack em all. The shield itself is useful for being that type of person, going in and out of fights. In a fight, take less damage from your actual health bar. Out of combat, get it back up fully in 30 seconds. Usually bought mid to late game. Supports dish out CC, but what about when getting dished the CC? This item, giving health and protections of both kind, also negates CC once hit with one, for a whole second. The CC has to be a hard one, meaning that it must completely disable all of Athena's movement for a while. This effect happens once every 70 seconds. One thing that is very common: Supports don't need [[Purification. They are meant to take CC to the face and walk it off. This item will help with that. One hard CC hit, and you will negate all other ones for a whole second. This can burn ultimates from the enemy, giving your team the edge. Recently reworked, it has risen to become meta in the duo lane. Usually built as an early bridge item, hitting enemies with a CC reduces their physical and magical protections by 15 for 5 seconds. The crazy part of this new passive is how easily you can apply it. Confound, and boom. Sell and replace in the late game. A luxury defensive item, bought usually dead last, because of it's cost. With it, you can either run in guns blazing to proc the stun and apply CC that you or maybe your team doesn't have. Secondarily, you can flee from your life, and a stupid assassin pops out the jungle, trying to claim the booty. But no, you stop them in your tracks, denying your assets, and dash away and give entrance to your allies. A beautiful tale. Can I get some more antiheal please? Magical Power and some flat penetration. If you hurt someone, they will heal only 60% as much for 8 seconds. Another one of those counterpicking items, this is if you want more damage, but also are facing some healers. The antiheal is more than that of Pestilence, but it's actively applied. The basic attack booster, this book gives the next basic attack you fire after using an ability 75% of your magical power as extra damage. You must use the effect within 8 seconds, and can happen every 3 seconds. This works well with you passive Reach, which itself adds an extra 15% of your magical power. This can also come in clutch if going for a cheeky Incon type objective steal. Tick tock. Power, Cooldown, and MP5. Back then, that's all this item. Now, every ten seconds, all your abilities' cooldowns are reduced by one second. This item is simple. Fire off more abilities in shorter amounts of time. It pairs up well with your Defender of Olympus and Confound, as they have long cooldowns, but are the more important abilities. Need for speed. Health, and a good amount too. CC reduction. Movement Speed, and if you didn't think you could o faster, whenever you're under a slow, instead, you move even faster and can't be slowed for 4 seconds, every 30 seconds. This is such a hard counter item to so many gods in this game. Some gods only have slows in their kits too, like Ra and Nemesis. This will definitely be useful when facing a team full of slows, or just if you need to exit fights faster. A highly under-appreciated item. Health, cooldown, and movement speed, just like Winged Blade. Also, all of your relics have 30 seconds taken off their cooldowns. Just think of all the uses this item has. You can use a relic on one side of the map, walk to the other side, and its up again. That's insane. So many implementations. I'll have to start using it more. One more counter pick item to finish off strong. Health, Cooldown, Attack and Movement speeds, and a reduction of surrounding enemy attack speeds. This is bought when you are facing a lot of Auto Attackers. We're talking Bellona solo, Sol Mid, Rama adc, and Arachne jungle. You need to stop all that DPS somehow. One last time, Athena is a Support. What does a Support do? To start, you will help the team to victory. More specifically, you will stay in the front, taking damage a lot and possibly feeding dying towards a bigger cause. Down below will be lists of what you will be doing. In the early stages of war, it's all about feeling out the enemy and getting your own team stronger. You will be entering the fray with a hunter/other carry as your partner in the longest lane of the map, the Duo Lane. It is essential to farm out minions and jungle camps for experience. This would mean you attack the wave, line of minions, until all of the enemy ones die, and then move on to the jungle and attack either the purple monsters for more pressure coming from you, or the red monsters for more damage coming from your Attack Damage Carry, further referred to as ADC or carry. As a clarification, the purple buff is to be given to you, and will decrease the physical protections of enemy gods around you by 10. The red buff is to be given either to your carry or to the mid laner mage or other if they are present at the time of clearing the jungle creeps. You can come about this in two ways. You can alternate the minion wave and jungle creeps as to efficiently get experience over a decent amount of time, or you can do one wave, do both buffs as they are called, and go back to lane. This supplies a quick leverage on your enemies, and is more risky, so use this tactic if ahead in lane. You also have the option to go into the Gold Fury's pit and attack the Oracles. They have the highest early game xp in the jungle, and provide vision for the whole pit, which can be crucial for predicting early enemy ganks. You will also be warding if you find the time to go to base and spend either 50 gold or 300. The 50 gold ones will give you one ward, which can provide vision for a part of jungle. The 300 alternate, Chalice of the Oracle, gives you two wards, and refreshes whenever you go to base. This is the better buy, but early game is expensive. If ahead, its a great buy that transitions into mid game. If behind, a great investment to stop ganks and make more call. This part of the game is when you bring your team into your equation. You will start rotating to to other lanes and applying pressure, and with you having noticeable levels, you can start to be a global presence. To rotate means to use the jungle to travel to adjacent lanes, but since your Athena, you have the luxurious travel of Defender of Olympus. Through this, you can gank or start an objective. You can also ward other parts of the map. By this time, you should have Chalice of the Oracle, as it basically gives free wards until you sell it. Do not forget about your primary goal of starting fights and winning the game. If you see a gang up on one side of the map, it could be helpful for you to sneak up and taunt, changing the enemy's focus and letting you win or save a teammate, depending on the situation. While in the jungle, you can also start some sneaky objectives. The Gold Fury doesn't take long, but takes long enough for enemies to be able to hear some abilities being activated in the jungle, so be careful. If you do catch the enemies trying to finesse some finances, call out to your team, ward if you have one to provide vision to your mates, and then initiate the steal. This is when you claim the reward for yourself by killing the monster before/while the enemies are. Also, while they are concentrated on killing it sneakily, get a taunt off and force a team fight. The enemy will likely have their forces weakened, resulting in an easy win and secure of the Gold Fury. Lastly, this part of the game, you should start looking towards structures. At least one tower. The pathway to getting these objective kills is through getting kills. Pressure teamfights or one-sided gangups on any lane of the map. Even in the jungle, if you catch a half health jungler near the mid harpies, best believe shes gonna be no health in a few seconds. Even one kill can lead to a tower, because the enemy team will be afraid to fight back when at a numbers disadvantage. Time to win. Farming and landing are a thing of the past. Now, it's warding, jungling, and ganking. Through those ganks, you can really push some lanes and get a leverage on your foes. Remember, one or two deaths means one or two towers. Some lanes can even have just a Phoenix. To deal with these, either win a major teamfight in that corresponding lane, or start a team fight in one lane, and have either your jungles or your adc split push. Another thing you should have your eyes on is the Fire Giant. This Goliath gives your team health and mana regeneration, and more damage towards structures. To pair with this is the Pyromancer right across, who gives extra movement speed when leaving base. Combine em, and you have a quick kill, a quick return to base, and a quick convergence on the enemy base as you decimate through their feeble forces. Because of the Fire Giant's importance, it is equally important to have constant vision on it. By this time, regular wards will have lesser use if the whole map is covered in them due to your due diligence. Therefore, Chalice of the Oracle is up to you to keep, but Sentry Wards are a must, as they also deny your enemies that same sought after vision. Putting one in the Fire Giant's pit can make sure you can see your enemies, but they can't see you. We have covered Athena extensively and how to use her. You are ready to fight. But then, who will you be fighting? Which gods in this game can conquer the mighty strategist at her own game? This section will answer such questions by highlighting who will stop you in your tracks, and how to push past those obstacles, as well gods who are weak compared to your intelligence. As a note, the gods will be sorted in alphabetical order. Also, easy means that you counter them, medium is evenly matched, and hard is a counter towards you. And as always, you are own worst enemy. Ares and Athena, while related, are completely different. With his ruthless atitude towards battle, he wins this matchup. Your clear is stronger than his, despite the recent buffs to Shackles. On that note, his Shackles can cripple you, taking away your engage. Your taunt can get him out of his Searing Flesh. His Bolster Defenses, however, kinda counters you, as in it gives protection and CC reduction for a duration, meaning that enemies will get out of your Confound easier. Lastly, his ultimate counters your ultimate. He can wait until your Defender of Olympus is almost done charging up, and then pull you back all the way to the other side of the map where he still is, putting you not only away from your own team, but in the midst of his, likely killing you. Both of you are great initiators, and stay for the thick of the fight. In the end, it comes down to the rest of the teams' compositions, and how well they work with their given protector. By yourself though, you will be found kneeling in his presence. This goddess has been un-BEAR-able since her release. This means that even the strongest intellect can not beat nature and it's most protective animal. Artio mainly has two sustains, Energy Surge and Life Tap. In a team fight, these can prove troublesome, as you'll have a harder time downing her and her team. If hit all 5 times by Life Tap, you will be rooted, which can leave you vulnerable to more CC. Her dash in bear form, Heavy Charge, lasts way too long and can create a huge gap between her and you. Confound can cancel this completely, making her mercy to your allies. Her hardest counter to you are both Entangling Vines and Ferocious Roar. The first is an area wide cripple that will not only cancel your dash, but also decreases your power, along as your protections when factoring her passive. The second is a huge stun that increases Artio's protections, making her even harder to kill. Silly drunkards are the literal opposites of scholars, and thus will be conquered mentally. Gotta hand it him though, Bacchus has one of the greatest initiations in the game.His jump, Belly Flop, has a knock-up AND a slow, meaning that he can setup for a lot of things. Especially his own ultimate, Intoxicate, can disable your teammates for a good 6 seconds. The easy part of countering him though, is that his initiation is his escape. After he jumps, taunt him to delay his ultimate activation. Belch of the Gods is his 3, with built in antiheal and a stun. This would be not necessarily a counter, but a nuisance, and is actually very avoidable, because the stun is on the last hit of the ability. Stupid decisions are usually made when under the influence, and this matchup is no exception. Oh mang has this one always been cancer. And against Athena, the statements is as mountainous as ever. His first ability is a one person stun. Seismic Crush lets him speed up towards that juicy booty and DEEPLY PENETRATES IT with high damage and a stun. This is his initiation tool, and usually used for ganking. which, paired up with his passive, lets him take less damage naturally - but stuns in a small cone. This comes out almost instantly, so you are feared to touch him and get close to him. His third CC, Tremors, pulls you closer to him while also making your movement uncontrollable. This is for when he's in the middle of a fight and setting up for an even bigger ultimate from his teammates. Lastly, the piece de resistance, Tectonic Shift traps you in a semi-circle of walls, with the only escape being towards him and his team. All in all, you're gonna lose. The newest god in the game, protector of the Underworld. He won't be sending you there anytime soon. His hardest CC, a stun on Paralyzing Spit, is very hard to actually hit, because it is a slim cone, and has to be perfectly spaced. Therefore, it's a tossup as to whether this will affect you greatly in a very fast fight where not everyone has time to space themselves for a stun. Of course, Confound can take him out of his main clear ability, Ghastly Breath. Not only this, but you have better clear than him with Shield Wall not being a tick ability. Like Bacchus, his escape is short distance away, and is mainly used as initiation for his Stygian Torment. This is a great ultimate that brings the enemies directly to the allies behind him, and has the potential to tag a whole team. The counter to this then, would be to redirect the team's attention once you're brought to them with a 4-5 man Confound, which can get your team two seconds of solid damage. Cerberus is less of a counter to Athena, and more counters whole teams, with passive antiheal, and actual heal stealing, and high sustainability. But you'll make short work of him. Greedy little dragon, you cannot steal intellect. An even macthup, due to the differences in strength. Fafnir and Athena are equal when it comes to farm. His can hit the whole wave and won't kill, while yours will almost kill the archers. You have great initiation and a easy to land hard CC, he has a skillshot stun and in dragon form, a jumping stun/disarm. One major difference is that he has a buff that he can give to his team, which can sway some fights. An attack speed isn't scary by itself, it's about who he gives it to. If they are under your tower and he pops the dragon version, that tower is gone. Therefore, while he can't start a teamfight effectively, he can definetely gain more from one than you. Let's discuss the virtuous elephant in the room who challenges you in all aspects. Ganesha is definitely the God of Success, because he can do anything and still support successfully. His main clear hits in a line, and gives his companion adc, or any other allies around him, a maximum of 10% extra damage done. In a fight, that much extra damage can mean hundreds of long term damage. He also has a potent silence, on par with Nox's, but omni-directional, and it also gives his teammates protections for silencing. If you try to walk up to the team and taunt, you won't be able to do it, and the enemies will be prepared for the next attack. His dash, Remove Obstacles, stuns and knocks up, keeping you in place for a quick second of pummeling. It's a great move to stop you in your tracks. Now, usually in a team fight, the groups are bunched up together, waiting for someone to make the first move. Dharmic Pillars exploits this like-mindedness by not only damaging you on the edges of its area, but slowing you once being damaged, and reducing your protections so that you take more damage. It also serves a purpose of securing an area, saying that if you want access, you better be ready to take some serious damage. While on paper it seems tilted towards you, it's not that set in stone. Geb has always been a staple Guardian, because he literally shields you, and he's also one of the oldest for sure. His main initiation, just like him, takes a long time to be potent in the game. He has to already been rolling for about 3 seconds to become CC immune, so a quick taunt and that's it. The reason Geb is picked is because of that shield I mentioned. It gives a maximum of 650(!) health, and cleanses any CC the target has once applied. This is a life-saver. Being cleansed of CC+a life shield, and you're back in the fight for a maximum of five seconds, or can now get to base and come back with full health. The ultimate, Cataclysm, is a classic AoE stun around himself. Because he will be in the center of everything, this is a great one for starting a teamfight, or setting up for a slew of other ultimates. The medium part of the matchup comes from the better clear than him, and the better initation, as you don't have to be in the middle to apply CC. The newest guardian added, but the goddess of intellect already has contingency plans to deal with him. His clear is just ridiculous. Venomous Haze deals damage in an area, and slows, so be mindful of them. They can also be used to empower his Consuming Bellow, which trembles enemies in the same fashion that Tremors does. On the terms of CC, he also has two minor knockups in Submerge and his Ultimate The World Serpent, which is the closest he can have to your global Defender of Olympus. In a teamfight however, one good Confound, and as he is very immobile, you can put this World Serpent into the ground where he belongs. Another life saver guardian, this bi bug can still be squashed under your stilettos. just spam Confound until it connects and boom, team fight started. He also has a small area root, with equally small damage. His two, Rising Dawn, is actually a pretty great clear tool, reduces physical protections, and gives his teammates damage mitigation up to 30% for 3 seconds, all the while you're taking tick damage. Scarab's Blessing is even more of a life saver than Geb's Stone Shield, because it actually revives you back with a portion of your health. Once applied, it also cleanses the person of CC and slows. As you can see, he's more of a bullet taking nuisance than a Guardian. He's meant for one person pickoffs and saves, not full on team fights, which makes him an easy opponent. The heaviest of sleepers, will no doubt keep you on your toes as you face off against him. His clear is crazy. Like, his Throw Back can hit one minion, that will hit the whole wave for more damage than he hit that one minion for. Normally, this is a dash, and most Kumbhakarnas will use this as an escape rather than an initiation. His root, Groggy Strike, is a line in front of him, and it roots for 2 seconds, a good chunk of time leading up to a good chunk of health taken from you. Oh boy this mesmerize. Mighty Yawn lasts 3 seconds, but if you are interrupted in your slumber, you will be slowed and have your attack speed lowered. The slow is crazy too. That's why, even though it's looked down upon, Mystical Mail can actually work on him, for that quick mes into lingering slow. Lastly, Mighty Uppercut is a CC immune dash, that damages and knocks up the first enemy hit, deals damage when they land back down, and knocks up everyone in the landing radius. This can put you out of the fight for a full two seconds, sort of like a banish, but able too look below yourself in horror as your team is useless without you. Don't sleep on this big fella. Usually one is smarter than to dive in head first against this watery god. His 1, if you can call it a clear, can slow you, and has innate health and protections. If Kuzenbo is building full tank, this thing is nearly unkillable for 6 seconds, when it dies theatrically. He has a reflect, Shell Spikes, that can deal minor damage, but still makes some people back away at fear of killing themselves. This can be activated while he is CCed, so even immobilizing him does not make him unable to do anything. And the displacement begins. This grab can take you a long way away from your team, and while your first instinct would be to Confound immediately, a 5 man taunt pointed towards you with no support is a death wish, as after the CC ends, you will be encircled in deities. Spin to win baby. Watery Grave is self explanatory. You will be pushed and bullied around by him, into his team, away from yours, and back to square one as your health reaches zero. It should be noted that he moves faster when ulting, and is CC immune, so that he can bully to the best of his abilities. Cya later alligator, this matchup is easy. First off, Sobek's clear is trash. Hits in a cone, he has to go to the side of the wave to hit them all. However, it does have some antiheal attached to it, and heals him, so it serves a purpose. His dash is also a stun/grab/knockback. Because he knocks you backwards to his team, this is an automatic setup for your Confound, so him grabbing you plays in your hands. His minor displacement, Tail Whip, is the same as the other one, where you now get a new position to assess the fight from. It's actually very weak in terms of displacement. Lastly, Lurking In The Waters slows all those around him, makes him CC immune, and regenerates his mana, not his health. He is still targetable, and doesn't actually move any faster, so he's just under some water. Guess this croc was in denile of his abilities. Studying the beauty of nature is always eye-opening, but this tree huger needs to learn a few lessons. One unique thing about Sylvanus is that his autos attack in an AoE, so his clear ability wise is trash, but basic attack wise, is on par with some meta guardians, like yours truly. He helps his team immensely through all stages of a fight. His Verdant Growth flowers give major MP5 to teammates, as to keep em topped off for teamfights, and can root and reduce the protections of enemies, so that in the middle of a fight, he can pop this on you, and you'll start wondering where all this damage came from. One of the earliest guardians with a heal, Wisps give heals and protections to allies, while it just damages enemies. It helps keep his allies up for more damage given and taken. His grab is one of the longest in the game, going a whole hunter basic, and then some. It is very skinny, however, so don't expect this as a hard counter, and is only mastered by the most proficient of Sylvanus'. His ultimate, Wrath of Terra, simply knocks up and does damage over time. In the middle of a team fight though, it can mean huge plays because it's a full second while you're in the air. His main weakness is that he's not the risky up close and personal initiator like you are, so he can't start a fight, he just prolongs it. But all things in nature come to an end. The mother of all Gods, trying to teach her grandkids a lesson. Terra has been doing pretty well this season. Her clear consists of either stunning the minions, throwing shrapnel at them, or ticking away their health. This makes her lane presence pretty good. On this, you guys have almost equal clear. Her heal, Monolith, is so minimal, it's laughable. It's not a heal, it's just some added HP5. When she destroys it however, she damages and roots everyone in the area. This initiation is on par with yours, because it sets up for a stun from her, an ult from a teammate, etc. Her ultimate, Earthen Fury, affects everyone around her. It gives allies and enemies 5% damage mitigation and intake respectively, as well as healing and damaging allies and enemies respectively. This in turn swings the fight at least 10% in her team's favor. Therefore, what you beat her in is global presence and mobility. A chinese mirror to Ares, at least this time you can be a-head. His main damaging tool is his Furious Roar, which does damage based on how much health you have. This can do well in lane, as it hits in a line. His initiation, Sky-Cutting Axe, comboed with is Hook Slam, is a great way of getting into the fight, gaining some protections while doing it, and then putting the enemies in their place, as to setup for future abilities. Let's not take too much time talking about his ultimate, Whirlwind of Rage and Steel. He spins around, gaining CC Immunity, grabs any enemies in range, and throws them towards his team. Afterwards, you can spam Confound for a good 3 man, if you don't get CC trained first. Finally on the list, is the first Guardian ever released, and he hasn't changed a bit. His Ice Wall directly counters your Preemptive Strike, as it cuts off any potential initiation you have. Also, Confound can not affect people on the other side of the wall, so this one ability makes you useless. His clear is one of the strongest. We're talking one of the highest base damage, along with high scaling, and he's clearing full waves at level 3. Frost Breath remains a staple hard CC, as it is a quick and easy cone stun, that lasts for 2 seconds. This can hit you right out of your dash, right after the taunt ends, and any point in between. It stops you right in your tracks and sets up for an even easier Glacial Strike for astounding damage, and a slow on top. Shards of Ice is one of those zone cut off ultimates that just dares you to enter. You get frozen, you could die off this. Not to mention it slows, so those already inside will find it harder to escape. He is your hard counter in everywhere. He may not have an escape, but he honestly doesn't need one, as he can just stroll in and break the ice. I had tons of fun making this guide. It was refreshing to come back into the SmiteFire community through a guide contest. Not only did I have to rebrush on my BBCoding skills, but I also learned some new stuff, like borders. It was also fun testing builds and items out during the guide making, which may be why it took my so long to finish. Hopefully this guide will bring you plenty of successful conquests and have you relishing on the spoils of victory. This has been IceColdPappsi, on the rocks. Dynasty Plate Helm is a bridge item and not a very good one at that and Jade Emperor's Crown hasn't been good since the last "adjustment" it got. Remove Jade and replace Dynasty with Celestial Legion Helm. Stone of Fal? Really? And Shoes of the Magi? I feel as if you just threw everything plus the kitchen sink into your items, Pappsi. I can't upvote this guide because it's way too generalized. 141290 Gulfwulf [[Dynasty plate helm]] is a bridge item and not a very good one at that and [[jade emperor's crown]] hasn't been good since the last "adjustment" it got. Remove Jade and replace Dynasty with [[celestial legion helm]]. [[Stone of Fal]]? Really? And [[shoes of the magi]]? I feel as if you just threw everything plus the kitchen sink into your items, Pappsi. I can't upvote this guide because it's way too generalized. Done, polished the items a little but more, thanks for bringing up the abundance of useless items to my attention. I had originally made this guide with the ability to build whatever you want and still be viable, as it was meant for newer people. 141293 IceColdPappsi Done, polished the items a little but more, thanks for bringing up the abundance of useless items to my attention. I had originally made this guide with the ability to build whatever you want and still be viable, as it was meant for newer people. How naive I was. I had actually played a ranked match as Athena last night, and I only lost because the Chaac solo was building Transcendence, Ninja Tabi, and was in the mace tree until we were like, where's ur defense? Hey papps, update this one before working on xing tian. 134652 boogiebass Hey papps, update this one before working on xing tian. It will be halfway during season 6 before that happens. 134661 Kriega1 It will be halfway during season 6 before that happens. Don't buy Gauntlet of Thebes until you have two protection items online that aren't your blessing or boots unless you're ahead. Thebes is a mid to late game item and you'll be vulnerable until it's stacked if you don't have any other protection items. 130531 Gulfwulf Don't buy [[gauntlet of Thebes]] until you have two protection items online that aren't your blessing or boots unless you're ahead. Thebes is a mid to late game item and you'll be vulnerable until it's stacked if you don't have any other protection items. I wouldn't use that as a hard rule. You could still get Gauntlet immediately after boots, but it's probably best to do so when you want early balanced protections because you plan to rotate immediately after building full stacks, and expect to see both physical and magical incoming damage at that stage. In addition, you want your duo to be a much better early game pairing than the other, where you don't expect too much threat...that'll make stacking safer and easier. And you don't need 2 protection items first...I'd say another common purchase order for a pure tank (no aggression via Void Stone) would be Shoes, Sovereignty, then Gauntlet. Sov gives you that prot and health...at least the health will still be functional against magical to a degree, allowing you a bit more safety in building stacks of Gauntlet. Also...for most cases...don't get Shoes of the Magi. Go more tanky (Reinforced) or get CDR (Focus). Void Stone is fine when you have (preferably) 2 other magical gods on your team, but you're not as well served with Magi in most cases. 130532 Branmuffin17 I wouldn't use that as a hard rule. You [i]could[/i] still get Gauntlet immediately after boots, but it's probably best to do so when you want early balanced protections because you plan to rotate immediately after building full stacks, and expect to see both physical and magical incoming damage at that stage. In addition, you want your duo to be a much better early game pairing than the other, where you don't expect too much threat...that'll make stacking safer and easier. And you don't need 2 protection items first...I'd say another common purchase order for a pure tank (no aggression via [[Void Stone]]) would be Shoes, [[Sovereignty]], then Gauntlet. Sov gives you that prot and health...at least the health will still be functional against magical to a degree, allowing you a bit more safety in building stacks of Gauntlet. Also...for most cases...don't get [[Shoes of the Magi]]. Go more tanky (Reinforced) or get CDR (Focus). [[Void Stone]] is fine when you have (preferably) 2 other magical gods on your team, but you're not as well served with Magi in most cases. Actually, I think of Gauntlet of Thebes as a bridge item for increased mid game protections that you can trade out for a later Mantle of Discord. In the early game, its 50 protections, plus 10 protection aura, and health is crazy early but underwhelming late. I also watched a video by EmilZy talking about how to build Thebes, and he cites that it depends on game to game. If the game is slow, it is great because of the extra survivability it gives your allies. However, in faster more kill-centric games, its passive would be useless because people are dying left and right that 10 protections is nothing. He also brings up that it can be built later than before or right after boots, just like you said. However, this situation would be if you are not the tanking objectives, or the pace has slowed down and you find yourself with a lot of gold along with your team already having some auras, this item can just top them off. Edit: Also, this guide is outdated to me because I actually have a new start and personal build for her. 130533 IceColdPappsi Actually, I think of [[Gauntlet of Thebes]] as a bridge item for increased mid game protections that you can trade out for a later [[Mantle of Discord]]. In the early game, its 50 protections, plus 10 protection aura, and health is crazy early but underwhelming late. I also watched a video by EmilZy talking about how to build Thebes, and he cites that it depends on game to game. If the game is slow, it is great because of the extra survivability it gives your allies. However, in faster more kill-centric games, its passive would be useless because people are dying left and right that 10 protections is nothing. He also brings up that it can be built later than before or right after boots, just like you said. However, this situation would be if you are not the tanking objectives, or the pace has slowed down and you find yourself with a lot of gold along with your team already having some auras, this item can just top them off. Edit: Also, this guide is outdated to me because I actually have a new start and personal build for her. Like Bran said, you want to keep Thebes once you have it stacked because of its protections and HP5. Also, the extra protections can help your squishier teammates. Basically my point was don't built it until you're comfortable with not having extra protections because you can be shut down easily while you're trying to get those stacks up; hence the reason I said two defensive items, though Sov is fine if the enemy is a 3/2 physical. It can even work for 3/2 magical, but you'll need to be a little more careful. 130546 Gulfwulf Like Bran said, you want to keep Thebes once you have it stacked because of its protections and HP5. Also, the extra protections can help your squishier teammates. Basically my point was don't built it until you're comfortable with not having extra protections because you can be shut down easily while you're trying to get those stacks up; hence the reason I said two defensive items, though Sov is fine if the enemy is a 3/2 physical. It can even work for 3/2 magical, but you'll need to be a little more careful. ...but I have major beef with your personal build example building freaking Mystical Mail late-game (or AT ALL). And you're getting Hide of the Urchin? Where the heck are your typical counter items? As Athena, you force people to basic attack you! You can immediately slow them all down with Midgardian Mail, or if you want the aggressive version, Hide of the Nemean Lion would be better examples. I know you have them as options...but those are WAAAAAY better STANDARD items against a normal Conquest comp than Mystical. Also, with you having good health contribution from Sov, Gaunt, and Void...I feel Hide of the Urchin is less needed. Sure it's a great tank item, but you already have good balanced protections in Gauntlet, and that shield isn't something you'll utilize as well as other roles. Once you get into a fight, you'll likely be in that fight for the duration. You're not a get-in-get-out god, so that passive shield won't be regenerating to give you added benefit during the fight. It's not a bad item, but I really like seeing more teamfight oriented items, especially for Athena. 130534 Branmuffin17 What? NO! It's great throughout the game! (Also, the link for the vid is [url=https://www.youtube.com/watch?v=jmvceAHry30]this[/url]) Also, this hasn't been updated for a couple of months...are we even commenting on something you feel is reasonably updated? Not too much has changed for [[Athena]] overall... ...but I have major beef with your personal build example building freaking [[Mystical Mail]] late-game (or AT ALL). And you're getting [[Hide of the Urchin]]? Where the heck are your typical counter items? As [[Athena]], you force people to basic attack you! You can immediately slow them all down with [[Midgardian Mail]], or if you want the aggressive version, [[Hide of the Nemean Lion]] would be better examples. I know you have them as options...but those are WAAAAAY better STANDARD items against a normal Conquest comp than Mystical. Also, with you having good health contribution from Sov, Gaunt, and Void...I feel [[Hide of the Urchin]] is less needed. Sure it's a great tank item, but you already have good balanced protections in Gauntlet, and that shield isn't something you'll utilize as well as other roles. Once you get into a fight, you'll likely be in that fight for the duration. You're not a get-in-get-out god, so that passive shield won't be regenerating to give you added benefit during the fight. It's not a [i]bad[/i] item, but I really like seeing more teamfight oriented items, especially for [[Athena]]. Mhm. Sit this boy down and educate him. 130535 boogiebass Mhm. Sit this boy down and educate him. I mean...his preferred build is functional for a tank. I just feel it doesn't pull out the strengths of Athena. Being able to force people to basic attack you is a huge thing for Midgardian Mail, adding further control and DPS loss with the AS/MS slow. 130539 Branmuffin17 I mean...his preferred build is [i]functional[/i] for a tank. I just feel it doesn't pull out the strengths of [[Athena]]. Being able to force people to basic attack you is a huge thing for [[Midgardian Mail]], adding further control and DPS loss with the AS/MS slow. As I said, I have a new build to try out with Athena because I haven't played her in a while, as well as a new start. 130560 IceColdPappsi As I said, I have a new build to try out with [[Athena]] because I haven't played her in a while, as well as a new start. One thing to remember about Thebes is that the aura's protections apply to you as well, so you'll be getting 60 protections when it's stacked and not just 50. 130572 Gulfwulf One thing to remember about Thebes is that the aura's protections apply to you as well, so you'll be getting 60 protections when it's stacked and not just 50. I was always gonna finish it. I thought u were hmming because ur an Athena main and I made an Athena guide and you were silently judging it. 125627 IceColdPappsi I was always gonna finish it. I thought u were hmming because ur an [[Athena]] main and I made an [[Athena]] guide and you were silently judging it. Oof, now I'm worrying if it's up to your expectations because ur a judge. 125629 IceColdPappsi Oof, now I'm worrying if it's up to your expectations because ur a judge. Never rely on other people to say if your work is good. You can only rely on yourself on that. If you trust you did your best and that you deserve the W, then show some confidence, but don't boast it. Extremes will hurt you. 125631 ThePerfectPrism Never rely on other people to say if your work is good. You can only rely on yourself on that. If you trust you did your best and that you deserve the W, then show some confidence, but don't boast it. Extremes will hurt you. Papps isn't a boaster, at least as far as I've observed. I think his concerns are valid, but at the same time, you're not the only judge. There are actually 6 judging. 125634 Branmuffin17 Papps isn't a boaster, at least as far as I've observed. I think his concerns are valid, but at the same time, you're not the only judge. There are actually 6 judging. And no...keep trying, Pris. Maybe one day. 125636 Branmuffin17 Didn't know those things "grew," but hey, if you've got a green thumb for it, awesome! XD And no...keep trying, Pris. Maybe one day. Papps isn't a boaster... I, on the other hand, am. I also give bribes. 125638 Estidien Papps isn't a boaster... I, on the other hand, am. I also give bribes. Objection! On the grounds of bribery and appealing to the court. 125639 IceColdPappsi Objection! On the grounds of bribery and appealing to the court. It was a grueling weekend, but I finished the items section. I personally love how I've evolved in my knowledge of BBCoding, cuz its all so colorful. 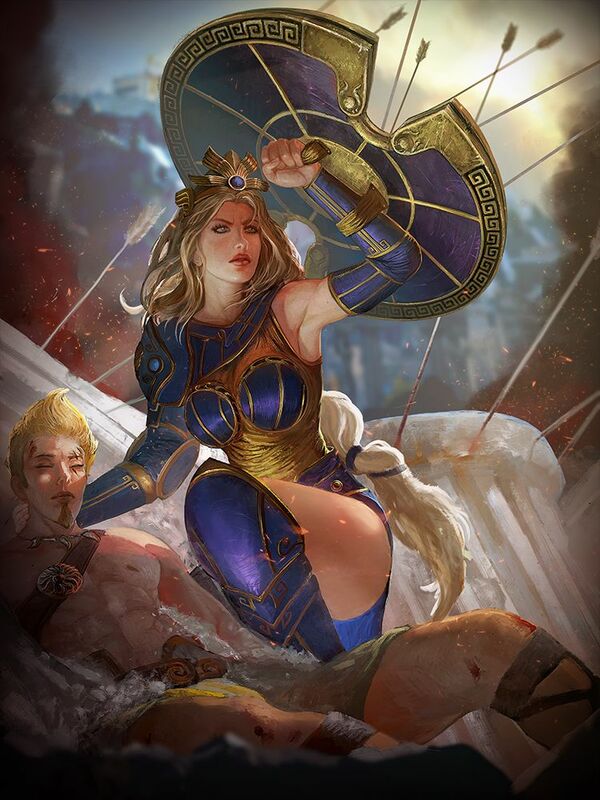 Quick question: should there be a chapter about who counters Athena? Also, lemme know what you think of the guide so far. 125388 IceColdPappsi It was a grueling weekend, but I finished the items section. I personally love how I've evolved in my knowledge of BBCoding, cuz its all so [url=http://absitomen.com/index.php?topic=331.0]colorful[/url]. Quick question: should there be a chapter about who counters [[Athena]]? Also, lemme know what you think of the guide so far. Curious, is there rhyme or reason to your skill leveling? It is so sporadic that I think you just started moving your hand and clicking, lol. For Preemptive Strike, you could also mention its early help for wave clear...dash through the entire wave, build up stacks of block, and you additionally get that Reach ranged basic to deal additional damage. Do it from your side at level 3 to scare enemies back (possible Confound threat), or just run straight at them, dash through the wave from the offensive side back to your teammate for safer positioning. Shield Wall: One thing you might mention is that this ability's high damage makes her one of the stronger jungle-clearing guardians...she is much better suited to being able to leave teammates and roam early, especially since she can ult right back to them if she's needed. If Jungle is struggling to clear everything, this will help her own leveling. Speaking of the ult, you might point out (at least for new players) that Defender of Olympus is better used very early in an engagement that is far away from you. If you wait too long (4.2 seconds charge time is pretty long), your teammate might be dead, and you've used your ult to go nowhere. It's also possible (not optimal but hey you do what you need to) that you need it for escape purposes...if you're out of position, ult away to teammates as long as you can weather the beating. Higher level use of this also requires you to quickly assess the situation...if the enemy team is like...4 on 1, and no other teammates are going to be nearby to help, ulting to that teammate will likely mean the death of you AND your teammate. Also, you say "This serves as protection, misdirection, and redirection." What exactly do you mean by the term misdirection? It's a clear indication of help arriving soon, and it's not like you can cancel out of it, so not sure how it's misdirection. You can force enemies to hit you with basics...I think Shield of Thorns is at least a functional situational relic option, but it's just not even mentioned...and works great combined with Hide of the Nemean Lion especially against crit. If nothing else it can force out beads. I have a different opinion on Jade Emperor's Crown. To me, it's an offensive early physical protection version of Sovereignty. Sov's passive benefit means you're best side-by-side with your ADC, sticking close to them and helping peel when necessary. With Jade, your aura doesn't do anything directly for your ADC...the aura affects enemies. This means the focus is shifted offensively, at least for your positioning. As such, it's a good option even against 3 phys/2 magical (you say best only against 4 or 5 phys, which should never happen unless playing against trolls or newer players...or using SMITE Roulette lol)...in this case, if they have a weak early game, and your ADC is strong early...and especially if they aren't watching the jungle and the jungler can sneak for a gank, then your initiation will help you come out with more health to possibly continue an assault into the jungle or other lanes. As an alternative situation, if they have a stronger early game, this item can possibly balance things to a point where you can make it a more even fight, if you're willing to be aggressive and can out-strategize them. Not sure what you mean by Hide of the Nemean Lion helping on 1 v 1s where cooldowns are long. It's damage reflection...mind explaining how long enemy CDs make this more functional? FYI for S5 they've changed magical protections for mages. So all gods typically will have as much as 48 inherent magical protection at level 20. (you discussed and said 30-40 in the Void Stone section) A more important thing you didn't mention about Void is that the protection reduction helps magical TEAMMATES also deal more damage. Moonflower Dance does 130 healing + 30% scaling at max level. Realistically, you might see a full Chang'e heal do a bit under 300 to a single target..You said it can reduce her heals by a hundred or two. Definitely not "or two," unless you're talking about her heals combined on multiple targets. Just pointing this out for accuracy's sake. Another pretty big exaggeration I'll point out is from Stone of Binding where you say your ADCs auto damage will "like, double." That's a huge overstatement. 10 pen early in the game might net your ADC maybe 15-20% more damage...but not double. You can force enemies to attack you, but you don't even have Midgardian Mail in your list of items =( Paired with Witchblade it's got incredible function. I know you throw them in there to provide options, and options are good, but I don't know if I'd even suggest Chronos' Pendant ever for her, except when trolling or just flat out demolishing the enemy team and you don't need to worry about anything. She's got many other items containing CDR that are usually going to be much higher priority that I just would never be able to fit this into my kit. Your example build looks funny. I'd personally suggest throwing that Urchin last, even if that's what your item list will look like late-game (since you'll replace the blessing). The way you show it, it's like you get Urchin first. Also...that's the 1 example build you want to provide for people to see? Strong utility Athena with absolutely 0 counter-type items? 125406 Branmuffin17 Good update overall, Papps. Since I know you, I won't hold back on some things =P [list][*]Curious, is there rhyme or reason to your skill leveling? It is so sporadic that I think you just started moving your hand and clicking, lol. [*]For [[Preemptive Strike]], you could also mention its early help for wave clear...dash through the entire wave, build up stacks of block, and you additionally get that [[Reach]] ranged basic to deal additional damage. Do it from your side at level 3 to scare enemies back (possible [[Confound]] threat), or just run straight at them, dash through the wave from the offensive side back to your teammate for safer positioning. [*][[Shield Wall]]: One thing you might mention is that this ability's high damage makes her one of the stronger jungle-clearing guardians...she is much better suited to being able to leave teammates and roam early, especially since she can ult right back to them if she's needed. If Jungle is struggling to clear everything, this will help her own leveling. [*]Speaking of the ult, you might point out (at least for new players) that [[Defender of Olympus]] is better used very early in an engagement that is far away from you. If you wait too long (4.2 seconds charge time is pretty long), your teammate might be dead, and you've used your ult to go nowhere. It's also possible (not optimal but hey you do what you need to) that you need it for escape purposes...if you're out of position, ult away to teammates as long as you can weather the beating. Higher level use of this also requires you to quickly assess the situation...if the enemy team is like...4 on 1, and no other teammates are going to be nearby to help, ulting to that teammate will likely mean the death of you AND your teammate. Also, you say "This serves as protection, misdirection, and redirection." What exactly do you mean by the term misdirection? It's a clear indication of help arriving soon, and it's not like you can cancel out of it, so not sure how it's misdirection. [*]You can force enemies to hit you with basics...I think [[Shield of Thorns]] is at least a functional situational relic option, but it's just not even mentioned...and works great combined with [[Hide of the Nemean Lion]] especially against crit. If nothing else it can force out beads. [*]I have a different opinion on [[Jade Emperor's Crown]]. To me, it's an offensive early physical protection version of [[Sovereignty]]. Sov's passive benefit means you're best side-by-side with your ADC, sticking close to them and helping peel when necessary. With Jade, your aura doesn't do anything directly for your ADC...the aura affects enemies. This means the focus is shifted offensively, at least for your positioning. As such, it's a good option even against 3 phys/2 magical (you say best only against 4 or 5 phys, which should never happen unless playing against trolls or newer players...or [url=https://www.smitefire.com/smite/forum/general-discussion/the-best-smite-site-smite-roulette-58528]using SMITE Roulette[/url] lol)...in this case, if they have a weak early game, and your ADC is strong early...and especially if they aren't watching the jungle and the jungler can sneak for a gank, then your initiation will help you come out with more health to possibly continue an assault into the jungle or other lanes. As an alternative situation, if they have a stronger early game, this item can [i]possibly[/i] balance things to a point where you can make it a more even fight, if you're willing to be aggressive and can out-strategize them. [*]Not sure what you mean by [[Hide of the Nemean Lion]] helping on 1 v 1s where cooldowns are long. It's damage reflection...mind explaining how long enemy CDs make this more functional? [*]FYI for S5 they've changed magical protections for mages. So all gods typically will have as much as 48 inherent magical protection at level 20. (you discussed and said 30-40 in the [[Void Stone]] section) A more important thing you didn't mention about Void is that the protection reduction helps magical TEAMMATES also deal more damage. [*][[Moonflower Dance]] does 130 healing + 30% scaling at max level. Realistically, you might see a full [[Chang'e]] heal do a bit under 300 to a single target..You said it can reduce her heals by a hundred or two. Definitely not "or two," unless you're talking about her heals combined on multiple targets. Just pointing this out for accuracy's sake. [*]Another pretty big exaggeration I'll point out is from [[Stone of Binding]] where you say your ADCs auto damage will "like, double." That's a huge overstatement. 10 pen early in the game might net your ADC maybe 15-20% more damage...but not double. [*]You can force enemies to attack you, but you don't even have [[Midgardian Mail]] in your list of items =( Paired with [[Witchblade]] it's got incredible function. [*]I know you throw them in there to provide options, and options are good, but I don't know if I'd even suggest [[Chronos' Pendant]] ever for her, except when trolling or just flat out demolishing the enemy team and you don't need to worry about anything. She's got many other items containing CDR that are usually going to be much higher priority that I just would never be able to fit this into my kit. [*]Your example build looks funny. I'd personally suggest throwing that Urchin last, even if that's what your item list will look like late-game (since you'll replace the blessing). The way you show it, it's like you get Urchin first. Also...that's the 1 example build you want to provide for people to see? Strong utility [[Athena]] with absolutely 0 counter-type items? Holy f**k, you tore me a new one. Lemme just redo the whole f***ing thing then, huh? Nah jk, I definetly get what you're saying. Let's go down the list. My leveling changed to better fit your first suggestion of leveling the 3 three times by level 6. I personally prioritize the taunt, but as per your words, do the three and two for the clear and safer options. After that, I level them up evenly, maxing taunt before my dash. I have actually noticed some enemy Athenas level dash first, and do this exact thing to my wave, and my duo feeds, so it's effective. Will add. Thanks for the note. Will add, but suggest one more relic so it's an even number and it fits well. Yes it's that serious. As you know, I am aggressive, and look for fights even at level 1 (im trash, be quiet), so this item in my eyes can affect those teamfights where the enemy solo or jungle has just been tearing through everyone, at least they do less damage. It can also affect the adc because basic attack damage scales off ability damage. As for the 4 or 5 phys comp, I said that as to state this is a niche item. As you compared it to Sov, that can be used in almost every build, as this is situational, such as in a jank or troll comp. Sorry, I was still in my Bellona mentality of using this item in 1v1s. For the cooldowns note, when all your cds are down, all ur reduced too is bashing them with your basics, which is why i said, but thats a throwaway statement. They did? That would make Void Stone less effective in late game, but still good to help your teammates. However, I already have this noted in there. Wow, only 30% scaling? So yeah, or two does sound a bit farfecthed. Will edit. Forgot this item, will add. Do I erase this item? I feel it can help if you don't have any CDR in your build. Yeah, my example build is wack, but thats how it shows up. Guardian's Blessing into Gauntlet of Thebes, follow up until Mystical Mail and sell starter for Urchin. Will order accordingly. That's just my standard build, it fluctuates every match or so. No really tho, you just went in on me. Where do you even find the time to write these? EDITED NOTE!!! Will publish changes when done with counters part and conclusion. 125413 IceColdPappsi Holy f**k, you tore me a new one. Lemme just redo the whole f***ing thing then, huh? Nah jk, I definetly get what you're saying. Let's go down the list. [list] [*]My leveling changed to better fit your first suggestion of leveling the 3 three times by level 6. I personally prioritize the taunt, but as per your words, do the three and two for the clear and safer options. After that, I level them up evenly, maxing taunt before my dash. [*]I have actually noticed some enemy [[Athena]]s level dash first, and do this exact thing to my wave, and my duo feeds, so it's effective. Will add. [*]Will do, great note. [*]I forgot to point out the bad in this ability, especially with the 4.2 second charge up. Prob add in the Important to Know part. Rethinking the misdirection part, i might just delete that... lol im dumb [*]Thanks for the note. Will add, but suggest one more relic so it's an even number and it fits well. Yes it's that serious. [*]As you know, I am aggressive, and look for fights even at level 1 (im trash, be quiet), so this item in my eyes can affect those teamfights where the enemy solo or jungle has just been tearing through everyone, at least they do less damage. It can also affect the adc because basic attack damage scales off ability damage. As for the 4 or 5 phys comp, I said that as to state this is a niche item. As you compared it to Sov, that can be used in almost every build, as this is situational, such as in a jank or troll comp. [*]Sorry, I was still in my [[Bellona]] mentality of using this item in 1v1s. For the cooldowns note, when all your cds are down, all ur reduced too is bashing them with your basics, which is why i said, but thats a throwaway statement. [*]They did? That would make [[Void Stone]] less effective in late game, but still good to help your teammates. However, I already have this noted in there. [*]Wow, only 30% scaling? So yeah, or two does sound a bit farfecthed. Will edit. [*]Another exaggeration, will change. [*]Forgot this item, will add. [*]Do I erase this item? I feel it can help if you don't have any CDR in your build. [*]Yeah, my example build is wack, but thats how it shows up. [[Guardian's Blessing]] into [[Gauntlet of Thebes]], follow up until [[Mystical Mail]] and sell starter for Urchin. Will order accordingly. That's just my standard build, it fluctuates every match or so. [/list] No really tho, you just went in on me. Where do you even find the time to write these? EDITED NOTE!!! Will publish changes when done with counters part and conclusion. Lol, I type quickly, didn't take me all that long honestly. As for erasing the item? Up to you...somewhere it might be useful. But for me, my build core would likely be Thebes, Shoes (if not Focus early, then Focus late game so you get some CDR there), Sov maybe, Void or Genji, then Spirit or 2 situationals...I'll always have at least 20% CDR in an end-build, and I don't think maxing is needed (though it's a luxury for sure). 125416 Branmuffin17 [quote=IceColdPappsi]Holy f**k, you tore me a new one. Lemme just redo the whole f***ing thing then, huh? Nah jk, I definetly get what you're saying. Let's go down the list. [list] [*]Thanks for the note. Will add, but suggest one more relic so it's an even number and it fits well. Yes it's that serious. [*]Do I erase this item? I feel it can help if you don't have any CDR in your build. [/list] No really tho, you just went in on me. Where do you even find the time to write these? [/quote] Lol, I type quickly, didn't take me all that long honestly. Well...you also missed [[Cursed Ankh]], so that's something you could add. You could also maybe take AWAY [[Blink Rune]] (I just don't know that I'd ever get that on her myself but I'm sure it's great for some players...probably just add Ankh) As for erasing the item? Up to you...somewhere it might be useful. But for me, my build core would likely be Thebes, Shoes (if not Focus early, then Focus late game so you get some CDR there), Sov maybe, Void or Genji, then Spirit or 2 situationals...I'll always have at least 20% CDR in an end-build, and I don't think maxing is needed (though it's a luxury for sure). Blink Rune is essential to a high risk high reward level of Athena of play. This guide offers many options in not only build items and counterpicking, but also playstyle in the description, and even uses in some items. It's all about how you play. I get it from time to time if I'm feeling confident in my team's ability and can build a bit more selfishly. Those tables are thicc my dude. Definitely improved. As for a counters chapter, yes. In case of a support, this is probably one of the most important things to know, as you'll have to outsmart the enemy a lot (you're the frontline). 125395 xZeroStrike Those tables are thicc my dude. Definitely improved. As for a counters chapter, yes. In case of a support, this is probably one of the most important things to know, as you'll have to outsmart the enemy a lot (you're the frontline). Will do counter section. Should it be like, who counters Athena and who does Athena Counter? Should it be all gods, or just limited to supports? Should unconventional supports be included? 125414 IceColdPappsi Thanks my dude, learned from the best :) Will do counter section. Should it be like, who counters [[Athena]] and who does [[Athena]] Counter? Should it be all gods, or just limited to supports? Should unconventional supports be included? Usually, it should be Supports and Warriors. They're the front and backline and are usually the ones to apply the most amounts of CC, and knowing how to counter those can be vital. If there are any other gods from other classes that severely counter Athena (or the other way around), would also be useful to mention. 125426 xZeroStrike Usually, it should be Supports and Warriors. They're the front and backline and are usually the ones to apply the most amounts of CC, and knowing how to counter those can be vital. If there are any other gods from other classes that severely counter [[Athena]] (or the other way around), would also be useful to mention. Okay, thanks for the feedback. I'll start with Enemy Supports, and then expand as I see fit. 125433 IceColdPappsi Okay, thanks for the feedback. I'll start with Enemy Supports, and then expand as I see fit. Confused on this: "Mighty Yawn lasts 3 seconds, but if you are interrupted in your slumber, you will be slowed and have your attack speed lowered. The slow is crazy too. That's why, even though it's looked down upon, Mystical Mail can actually work on him, for that quick mes into lingering slow." I don't see how Mystical works at all on him...it's something that messes with his mez if his OWN TEAMMATES hit enemies he's mesmerized. Reading that made me suspicious about other matchups...the next one I read, Artio, looks good...but with Bacchus, you talk about using a taunt after a Belly Flop to delay ult use...which is great, but you don't talk about another aspect, which would be to pull him out of his Belch of the Gods, which can be an issue for teammates. Otherwise, though, I think you've got some good general info on the matchups. 125586 Branmuffin17 Confused on this: "Mighty Yawn lasts 3 seconds, but if you are interrupted in your slumber, you will be slowed and have your attack speed lowered. The slow is crazy too. That's why, even though it's looked down upon, Mystical Mail can actually work on him, for that quick mes into lingering slow." I don't see how Mystical works at all on him...it's something that messes with his mez if his OWN TEAMMATES hit enemies he's mesmerized. Reading that made me suspicious about other matchups...the next one I read, [[Artio]], looks good...but with [[Bacchus]], you talk about using a taunt after a [[Belly Flop]] to delay ult use...which is great, but you don't talk about another aspect, which would be to pull him out of his [[Belch of the Gods]], which can be an issue for teammates. Otherwise, though, I think you've got some good general info on the matchups. Aight so, just saw this, contest already ended so can't update it, but here's my input on your points. First, most people would say the Kumbhakarna and Mystical Mail should never go together. However, when you read it objectively/on paper, the tick damage will give them a quick stun/mes, and the immideately slow them, which is why it is utilized by some. Sorry if the wording was weird. I actually forgot how Belch of the Gods can be interrupted by Confound, taking away the potential stun from him, and then stopping his combo from stun to ult. Will add after judging period. 125630 IceColdPappsi Aight so, just saw this, contest already ended so can't update it, but here's my input on your points. First, most people would say the [[Kumbhakarna]] and [[Mystical Mail]] should never go together. However, when you read it objectively/on paper, the tick damage will give them a quick stun/mes, and the immideately slow them, which is why it is utilized by some. Sorry if the wording was weird. I actually forgot how [[Belch of the Gods]] can be interrupted by [[Confound]], taking away the potential stun from him, and then stopping his combo from stun to ult. Will add after judging period. Actually feel free to update. Management feels it's okay to do so...don't want the guides to not be the best they could be at any given point just because of a contest. On the flipside, don't expect updates past the deadline to be judged in the revised form...in fact, I've already completed all of mine, so I won't be re-looking at it if you do (and have already judged others that have since been updated too). 125632 Branmuffin17 Actually feel free to update. Management feels it's okay to do so...don't want the guides to not be the best they could be at any given point just because of a contest. On the flipside, don't expect updates past the deadline to be judged in the revised form...in fact, I've already completed all of mine, so I won't be re-looking at it if you do (and have already judged others that have since been updated too). She's likely to be a top ban for s5... Make sure you've got a good backup Support or two. 125141 Branmuffin17 She's likely to be a top ban for s5... Make sure you've got a good backup Support or two. Always have like two or three backups/pockets. My legendaries are khep and bacchus, with ymir at 4, geb at 2, terra and faf at 1, and hope to play more ganesha in the future. 125142 IceColdPappsi Always have like two or three backups/pockets. My legendaries are khep and bacchus, with ymir at 4, geb at 2, terra and faf at 1, and hope to play more ganesha in the future. T1 shoes at the start is just not very efficient. S5 has changed a lot of things...with a support that is likely to attend their ADC for the first few minutes, 500 gold for just 6% MS is expensive. Soooo...what item will give you more bang for your buck and still allow you to get extra potions? I level her skills pretty erratically, but yours looks crazy! I personally would choose her dash at 2nd level...better for escape / mobility, and another thing you can use on the minion wave or buff camps, followed by Reach. In most cases, you're not going to be super aggressive or need Confound unless the jungler goes for an early surprise gank attempt or something. I would probably get at least 3 points into Shield Wall by level 6...it will allow you to branch off and clear most jungle camps easily if you split from the ADC, and will help on the damage front. Then I would consider which of Preemptive Strike or Confound is needed more...if you've got teammates that can take advantage of your taunt a lot, then Confound might be great, but keep in mind, each level increases cost but only increases taunt by 0.25 seconds... Preemptive Strike, which you say to level last, actually gets you an increasing slow, higher damage, and lower CD (meaning you can maybe initiate a fight, do your stuff, and then have it up again in time to chase or escape a finishing fight). So I'd place somewhat higher priority on the dash. Season 5 just started, havent had time to play alot of athena supp, but I like the guardians blessing into t1 thebes start, with some potions. Will change accordingly. And yeah, my leveling is very aggressive. Its so that after the second or third wave, you can start to apply pressure on your teammates. A taunt or two, while you may not get off a lot of damage from it, can make them back off from the minions that just started attacking them, letting the adc attack the other wave without much challenge. On top of that, the dash and taunt are a mixup for me. Depending on how the game goes, you can change out one for the other. 125159 IceColdPappsi Response: Season 5 just started, havent had time to play alot of athena supp, but I like the guardians blessing into t1 thebes start, with some potions. Will change accordingly. And yeah, my leveling is very aggressive. Its so that after the second or third wave, you can start to apply pressure on your teammates. A taunt or two, while you may not get off a lot of damage from it, can make them back off from the minions that just started attacking them, letting the adc attack the other wave without much challenge. On top of that, the dash and taunt are a mixup for me. Depending on how the game goes, you can change out one for the other.